At Campaign Launch, Milne Vows to Oppose Shumlin's "Ultra-Progressive Agenda"
Former state representative Marion Milne watches her son, Scott Milne, announce his candidacy for governor. Pomfret businessman Scott Milne kicked off his underdog campaign for governor Wednesday morning by promising to replace Democratic Gov. Peter Shumlin's "ultra-progressive agenda" with his own "moderate Republican" solutions. "I promise to run a campaign of ideas," he said. "I promise to provide the voters of Vermont with an alternative to the present administration, which has failed by steering the ship of state into uncharted waters — making promises it cannot fulfill and, I would argue, ignoring the basic needs of Vermonters." 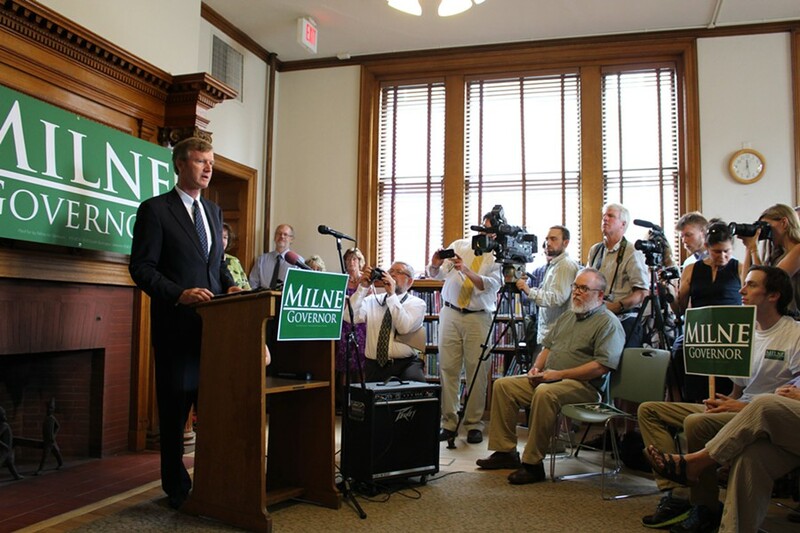 Milne, who filed papers to run last month, made his formal announcement before a robust crowd of supporters and Republican officials at Barre's Aldrich Public Library. 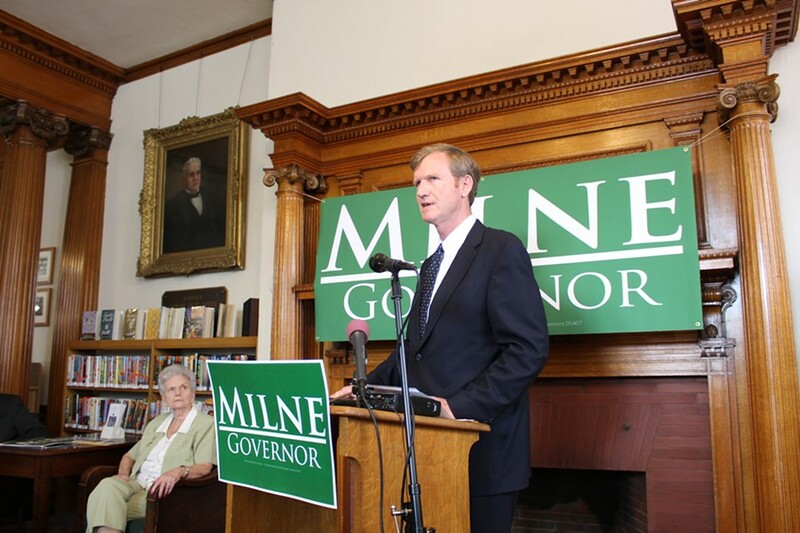 He was introduced by his mother, former state representative Marion Milne, and by former governor Jim Douglas, who hailed the younger Milne as "the next governor of the great state of Vermont." 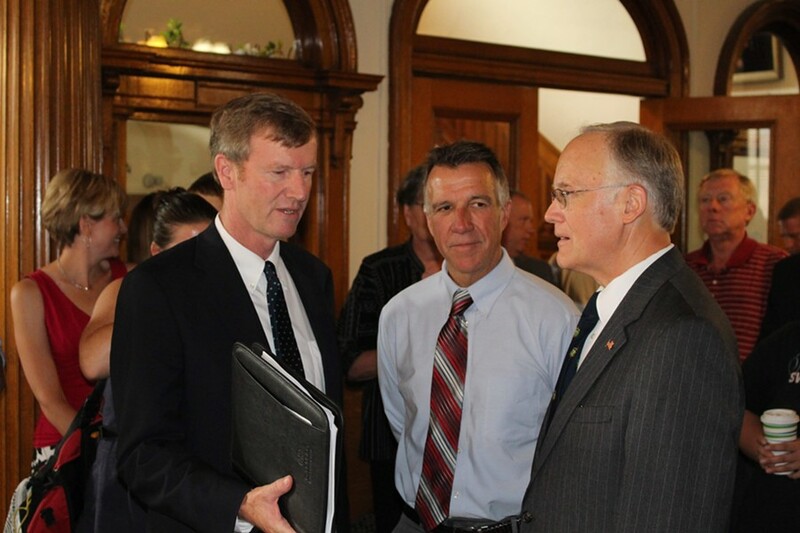 Though Milne promised at the get-go to refrain from "vilifying the governor," he devoted much of his remarks to a harsh indictment of Shumlin's four years in the state's top office. The incumbent, his challenger said, must not skate to reelection "without having to answer for his misjudgments or fail[ing] to justify his actions," while Shumlin's administration "must answer for its shortcomings and its over-reachings." "He must answer for his unkept promises and his mistakes," Milne said. "The bubble of his rhetoric must be deflated and seen for what it is. I suggest we wipe away the foam and see what's left." A real estate developer and president of family-owned Milne Travel, Milne noted that he comes "from the world of business," which, he said, "needs and respects government, but is wary of too much government." The son and grandson of Republican state legislators, he said he came from "a long line" of moderates, who "practice cautious and understated optimism." "Our government should not take on unnecessary risks, particularly when it comes to spending money we don't have, raising taxes we can't afford, creating programs that have no proven likelihood of success," he says. "And if you agree with me, we want to end this era of unbridled experimentation with our government." Milne twice referred to the news media's focus on his lack of political experience and campaign cash, but he argued that neither would keep him mounting a competitive campaign. "I start this race fully appreciating the slope of the hill that we have to climb. Incumbency is, in itself, a powerful advantage — as is a huge bank account," he said. "I coulda stayed out of the campaign for governor. I love Vermont and I want to see people succeed. For that reason, I'm compelled to challenge the governor and his agenda." Lt. Gov. 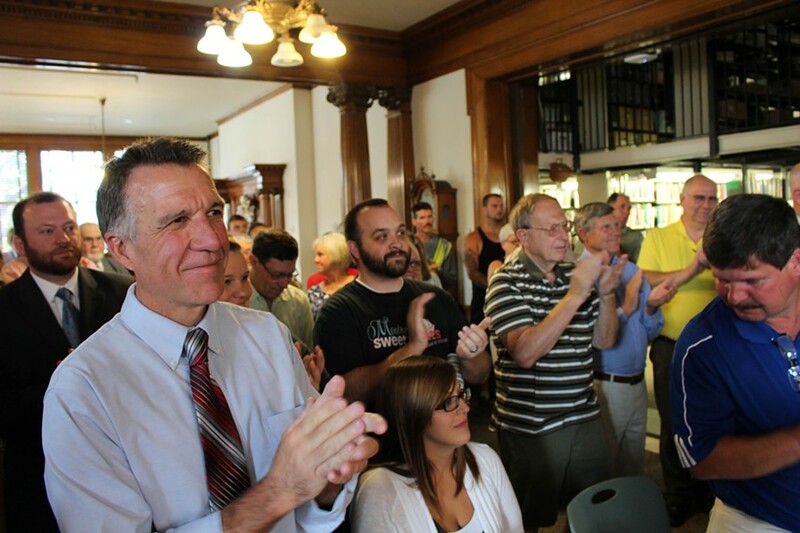 Phil Scott applauds as Scott Milne announces his candidacy. In introducing Milne, Douglas echoed the point that underdogs occasionally come out on top. "He understands the magnitude of the task, but I think we've seen very clearly over the recent past that the size of the war chest doesn't necessarily mean the outcome of the race. I have just two words: Eric Cantor," Douglas said, referring to the recently deposed majority leader of the U.S. House. "So things are changing, and I think Scott's going to be able to take advantage of that tremendous opportunity." Douglas, who has generally refrained from attacking his successor, leveled tough charges at Shumlin. Douglas said Vermont has seen its workforce shrink, school enrollment drop, property taxes rise and residents flee the state. Worst of all, he said, was Shumlin's oversight of the federally mandated health insurance exchange, Vermont Health Connect, and uncertainty surrounding his proposed single-payer health care overhaul. "We recently had a health care exchange rollout. Perhaps you heard about that. It didn't go so well," the former governor deadpanned. "There's sort of a combination of incompetence and confusion, I guess, but they're going to try for more. They want to shift a sixth of our state and national economy into an untested single-payer, state-run, government-financed scheme. We don't know how it will work. We don't know how much it will cost. We don't know how we're going to fund it." "Other than that," Douglas said, "it sounds like a great idea."